The stories from past, present, and future warriors. The initial stories are from the "Old Bastards" a group of past warriors. A war story usually begins with the statement, "No S#/t, this really happened". Senior Good Conduct Medal - Ben A. From 1975 through 1978, I was assigned by Army Material Command as the Logistics Assistance Officer – Europe, with headquarters in Heidelberg, Germany. I had representatives with me from the AMC Commidity Commands including tank, automotive, missile, ammunition, aviation, etc. The LAO normally attended staff meetings with the CG USAREUR but, my boss and rating officer were in AMC HQ, in Alexandria, VA. This story concerns enlisted good conduct medals. There is a unique ending. I told him that we have a critical financial problem with our tank rebuild plant in Mainz. EUARSEUR units were sending tanks to Mainz for engine rebuild maintenance without engines. They had no OVM on board, and sometimes they had live ammunition on board. We realize that supply sergeants like to have additional replacement parts, but Army Material Command has to buy those parts to complete the tank overhauls. We are also ill prepared to remove and secure the live tank ammunition left in the tank. As you can imagine, those commanders didn’t think too kindly of Army Commanders and a Colonel who were wearing good conduct medals. How I Began My Military Career-Ben A. This is an account of my US Navy enlisted service from January 1943 to March 1946. I probably traveled further in those 38 months that I did in the 30 years in the US Army. I finished high school in Thatcher, Arizona in 1941which turned out to be a tough year for entering military service. Fortunately I graduated at age 16, not due to my natural brilliance, but the fact that the state of Virginia only had 11 years of schooling at that time. I started school in Virginia in 1930 and continued there until we moved to Arizona in 1938. In early 1942, my father, an Army Captain, received order to go to Eritrea to serve with the British forces there. Before he left he told me NOT to enlist in the military. I was supposed to return to school and sharpen my math and other high school subjects. He wanted me to attend Virginia Polytechnic Institute and enroll in ROTC. As a Seaman Second Class my first ship was the USS Milwaukee. It was a light cruiser. It’s home port was Recife, Brazil. Its mission was to search for and destroy German submarines. A destroyer accompanied us. It provided the sonar to detect the enemy subs. We would sail for two weeks along the equator for to Africa and return to Recife for a day of liberty. After approximately four months of this duty the ship was ordered to proceed to New York. The next mission was to accompany a convoy of troop ships To Belfast, Ireland. We then sailed to Edinburgh, Scotland for two days of liberty. From there we sailed North to Scapa Flow, Scotland where we joined a British convoy in route to Murmansk, Russia. When we arrived there we would transfer the Milwaukee to the Russian Navy. The transfer required 30 days of training the Russians. During that time we lived on one half of the ship and the Russians on the other half. The name of the cruiser was changed to the Mermansk. The US flag was replaced by the Russian flag to signify the completion of the transfer. Without a ship we were assigned to US liberty ships and British ships for our return to Scotland. Four other sailors were with me on a liberty ship for the journey. About half way back to Scotland we were attacked by two German subs off the coast of Norway. They launched two torpedoes at the “baby” aircraft carrier in the fleet, but a liberty ship took the hit. It sank immediately with the two torpedoes in her hull. Several hundred Russian sailors in the ship’s hold went down the ship. The subs proceeded ahead of the convoy and released mines that floated back into our convoy. Upon reaching Scapa Flow we thought we would be transported back home to get a new light cruiser. No such luck! Our mission was to go to Barry, Wales and re-commission the SS President Warfield and proceed to Milford Haven, Wales and participate in the invasion of France, on June 7, 1944. Our mission, along with three other similar ships had been transferred to the British Navy in 1942. These ships, along with other similar ships, were to go to Normandy, in case the Omaha Beach mission failed. It didn’t. We were sent anyway and remained there to provide support until replaced by a relief crew. Then it was back to Glasgow, Scotland to board the British ship the Queen Elizabeth that took us back to the US. After taking some leave time my shipmates and I were sent to Norfolk and assigned to the battleship USS New York. We set sail after a couple of weeks. The ship sailed South to Panama, sailed West through the canal and proceeded across the Pacific Ocean to participate in the battle of Iwo Jima. We bombarded Mount Suribachi for three days. Unfortunately a blade on the starboard propeller broke off. We were then sailed (limped) South to the small island, Manus, near New Guinea to go into a floating dry dock to replace the broken screw. It took three weeks to get the propeller replaced so that we could back into the battle. We joined the fleet that was assembled to attack the island of Okinawa. We provided support for a Marine Division going ashore in the City of Naha. After expending expending our 14 inch shells, we sailed to a small island off of Okinawa to rearm. During the process I had the misfortune to my hand get in the way of a nose cone on a 14 inch round. That cost me the end of my left right thumb. Feeling sorry for me, I was ordered to leave the ship and proceed to San Diego to attend the Navy gunnery advance course. The only proviso was that I had to “hitchhike” back. It took 30 days and six different ships to get there. The war ended in August 1945 and I was assigned to Little Creek, VA near Norfolk to complete my Naval service in March, 1946. But enough of my sea stories – I have sailed both oceans – from the equator to the North Pole in the Atlantic and from Iwo Jima South to the equator and New Guinea. This amounts to a multitude of travel. I enjoyed my service with the Navy. Much of what I learned during my Navy service I was able to use during my Army service from 1950 to 1979. But, that is another story. This is obviously not a war story of mine, but I wish to post this tribute to a true and worthy U.S. patriot. MORGANTOWN, W.Va. – He didn't seek the spotlight, but when Frank Buckles outlived every other American who'd served in World War I, he became what his biographer called "the humble patriot" and final torchbearer for the memory of that fading conflict. Buckles enlisted in World War I at 16 after lying about his age. He died Sunday on his farm in Charles Town, nearly a month after his 110th birthday. He had devoted the last years of his life to campaigning for greater recognition for his former comrades, prodding politicians to support a national memorial in Washington. When asked in February 2008 how it felt to be the last survivor, Buckles said simply, "I realized that somebody had to be, and it was me." Only two known veterans remain, according to the Order of the First World War, a Florida group whose members are descendants of WWI veterans and include Buckles' daughter. The survivors are Florence Green in Britain and Claude Choules in Australia, said Robert Carroon, the group's senior vice commander. Choules, who served in Britain's Royal Navy, was born in that country but now lives in Australia. Green turned 110 on Feb. 19, and Choules turns 110 in March, he said. Born in Missouri in 1901 and raised in Oklahoma, Buckles visited a string of military recruiters after the United States in April 1917 entered what was called "the war to end all wars." He was repeatedly rejected before convincing an Army captain he was 18. More than 4.7 million people joined the U.S. military from 1917-18. By 2007, only three survived. Buckles went to Washington that year to serve as grand marshal of the national Memorial Day parade. Unlike Buckles, the other two survivors were still in basic training in the United States when the war ended, and they did not make it overseas. When they died in late 2007 and 2008, Buckles became the last so-called doughboy — and a soft-spoken celebrity. Details for services and arrangements will be announced later this week, but the family is planning a burial in Arlington National Cemetery. In 2008, friends persuaded the federal government to make an exception to its rules for who can be interred there. President Barack Obama ordered that the day Buckles is buried that all U.S. flags on official buildings be lowered to half-staff. Buckles had already been eligible to have his cremated remains housed at the cemetery. Burial, however, normally requires meeting several criteria, including earning one of five medals, such as a Purple Heart. Buckles never saw combat but once joked, "Didn't I make every effort?" U.S. Rep. Shelley Moore Capito and the rest of West Virginia's congressional delegation were also working Monday on a plan to allow Buckles to lie in repose in the rotunda of the U.S. Capitol. According to the Architect of the Capitol's website, the last person to do so was President Gerald Ford. The honor is reserved mostly for elected and military officials, but others have included civil rights activist Rosa Parks and unknown soldiers from both World Wars and the Korean War. Sen. Jay Rockefeller called Buckles "a wonderfully plainspoken man and an icon for the World War I generation" and said he will continue fighting for the memorial Buckles wanted. "He lived a long and rich life as a true American patriot," said Sen. Joe Manchin, "and I hope that his family's loss is lightened with the knowledge that he was loved and will be missed by so many." The family asked that donations be made to the National World War One Legacy Project. The project is managed by the nonprofit Survivor Quest and will educate students about Buckles and WWI through a documentary and traveling educational exhibition. "We have lost a living link to an important era in our nation's history," said Secretary of Veterans Affairs Eric Shinseki. "But we have also lost a man of quiet dignity, who dedicated his final years to ensuring the sacrifices of his fellow 'Doughboys' are appropriately commemorated." In spring 2007, Buckles told The Associated Press of the trouble he went through to get into the military. "I went to the state fair up in Wichita, Kansas, and while there, went to the recruiting station for the Marine Corps," he said. "The nice Marine sergeant said I was too young when I gave my age as 18, said I had to be 21." Buckles returned a week later. "I went back to the recruiting sergeant, and this time I was 21," he said with a grin. "I passed the inspection ... but he told me I just wasn't heavy enough. "Then he tried the Navy, whose recruiter told Buckles he was flat-footed. Buckles wouldn't quit. In Oklahoma City, an Army captain demanded a birth certificate. "I told him birth certificates were not made in Missouri when I was born, that the record was in a family Bible. I said, 'You don't want me to bring the family Bible down, do you?'" Buckles said with a laugh. "He said, 'OK, we'll take you.'" Buckles served in England and France, working mainly as a driver and a warehouse clerk. An eager student of culture and language, he used his off-duty hours to learn German, visit cathedrals, museums and tombs, and bicycle in the French countryside. After Armistice Day, Buckles helped return prisoners of war to Germany. He returned to the United States in January 1920. After the war, he returned to Oklahoma, then moved to Canada, where he worked a series of jobs before heading for New York City. There, he landed jobs in banking and advertising. But it was the shipping industry that suited him best, and he worked around the world for the White Star Line Steamship Co. and W.R. Grace & Co. In 1941, while on business in the Philippines, Buckles was captured by the Japanese. He spent more than three years in prison camps. "I was never actually looking for adventure," he once said. "It just came to me." How I Began My Military Career-"Sam" S.
Four things in life I said I was never going to do -- join the military, get married, be a preacher, or work for the VA! Guess what? Watch out what you tell the Almighty about what you are not going to do! I served five years in the Army Reserves, 30 years active duty as a chaplain, 42 years of marriage, and 10 years as a chaplain at the VA Eisenhower Medical Center. And I can’t forget the almost nine years as the senior pastor of the Rock of Ages Evangelical Free Church, Leavenworth, Kansas. How did this all come about? A sweet young gal named Linda came swimming by my lifeguard raft in Northern Minnesota. Four years later we were married. What a gal! My dad, a WWII combat engineer, and my uncle Bill Meadows, a former Marine, kept telling their war stories. Barry Sadler kept singing about the Green Berets on the radio. I heard the call. I signed up for the US Marines, OCS, and was supposed to report for duty in October, 1965. They lost my paper work. Does that sound familiar? Meanwhile I went to Ft. Snelling, Minnesota and signed up as a lab tech, combat medic. I didn’t tell them about being sworn into the Marines. I called the Marines and told them I changed my mind. I should have heard from them about the lost paperwork. They said they would get back to me. I’m still waiting for that call. I was wild medic to say the least. The major threatened to send me and my wise guy buddies to active duty driving ambulances in Viet Nam. That got our attention. The unit chaplain and my youth pastor heard that I was interested in youth ministry. They recognized that the military was the largest “youth group” in the world. Acting wild in a serious business could cost folks their lives. They told me that the Army needed “fired-up” chaplains to bring faith in someone bigger than themselves. Meanwhile, Linda felt the call to be a missionary. I was out-numbered and out-gunned. I became a 2nd LT chaplain candidate in 1967 and went on active duty as a chaplain at Ft. Leonard Wood, MO. After that I was assigned to the Lane Army Heliport of the 7-17th Cav, An Son, Viet Nam, and the rest is history. I have served as chaplain for thousands of great soldiers, their family members and more than a few great general officers. They are indeed a huge youth group. Many gave their lives for the cause of freedom. Along the way I had the complete support of a number one military wife. Thank you, Linda. I’m still serving as a chaplain for the VA, the bone yard of wounded warriors, and am a member of the Old Bastards, another group of old warriors. I make an effort to bring faith, hope and love to the broken down troopers at the VA and the OB’s. Never say never. Walk by faith, not by sight. If Moses could handle his most difficult assignment at age 80, Caleb at 85, and those stepping out in faith in Hebrews Chapter 11, I never say never. Serving as a pastor and chaplain for 40 years, I never say never. Serving 35 years in the Army, and 10 years with the VA, I never say never. Being blessed with a wonderful marriage for 42 years, with five children, I never say never. It is no secret what God can do when you step out in faith! By the way, still waiting for a call from the Marines. Apparently the paper work hasn’t surfaced yet. I wouldn’t trade it all for anything. May our Heavenly Commander continue to bless and keep us all. The Battle of Soui Tre (LZ Gold)-Joe B. The Battle of Soui Tre took place March 18 and 19, 1967. At the time I was the Commanding Officer (CO) of the 118th Attack Helicopter Company (AHC). The company was a part of the 145th Combat Aviation Battalion. For this operation out battalion was augmented with the 335th AHC on March 18 and the 68th AHC on March 18th. On the above date the 145th Combat Aviation Battalion had the mission to insert an Infantry unit into a landing zone (LZ) in War Zone C. The operation was staged from a pickup zone (PZ) located on the edge of Ap Trai Dan. The Infantry unit’s mission, with a direct support artillery unit, was to establish a fire base om the location of the LZ. The original plan called for an Armored Cavalry unit to go out and secure the LZ. Once secured the 145th Cbt Avn Bn was to airlift the Infantry unit from the PZ to the LZ. I believe it was to require six or seven lifts. En route to secure the LZ the Armored Cav unit was ambushed and stopped. Their efforts during the day were unsuccessful and they failed to complete their mission. There were two Assault Helicopter companies participating in this battalion operation - the 118th AHC under my command and the 335th AHC, a company on loan to the 145th from the 173rd Airborne Brigade. The 335th was assigned as the direct support aviation company. Around mid-afternoon a standard combat assault operation was considered but rejected. After waiting all day, the 145th mission was cancelled and the AHC’s were released to return to their respective home bases. The mission would be continued on March 19th. On this date the 145th Cbt Avn Bn had the mission to return and complete the mission from the previous day. This time it would be a combat assault insertion of the Infantry unit. The operation was again staged from the PZ on the edge of ApTrai Dan. The 118th AHC was a participating unit. The 68th AHC replaced the 335th AHC on Sunday. Our final briefings on the operation were conducted at the PZ. The 68th AHC was designated the lead company for the operation. The final briefing provided several facts - War Zone C had a limited number of LZ’s that could handle a battalion sized combat assault; no preparatory fires were planned; and our formation would have ten aircraft in each company. There would be a two-minute separation between the two companies. The operation began around 0900. The 68th made its approach into the LZ, disembarked their troops; took off and reported the LZ “COLD”. It was a surprise and some relief to hear that transmission. The 118th made its approach to the LZ. The troops disembarked and I was just starting my takeoff when there was a horrendous explosion behind me. Radios became alive and reported that three aircraft near the middle of our formation had been damaged and were burning. The 118th aircraft managed to fly out of the LZ. One aircraft from the 118th reported control problems and had to quickly land just a short distance away from the LZ. A Bandit Gun Team put protective cap on them until help could arrive. Five aircraft got back to the LZ, still in flyable condition. A sixth aircraft got back to the PZ a little bit late despite moderate damage. It could not be used when the mission continued. At this point the 118th had only five operational aircraft. The operation was temporarily stopped to assess the situation. In a span of a few minutes the operation was resumed. The troops on the ground from the first lift would secure an area in the LZ to accommodate flights of five aircraft. In the second lift, the two flights of five ahead of me in the 68th went in and out with no problems. As directed, I came to a hover and the troops jumped out. Before I could start my takeoff, there was a strong explosion in front of my helicopter. Everything went black and the XO and I were both struck by debris The explosion blew out the chin bubbles, part of the windshield and bent the front doors. We had to exit the aircraft through the cargo doors. The major explosion to the 118th’s formation in the first lift was a rigged unexploded 250-pound bomb. It was an assault that could have had fewer difficulties for our unit, but it was successful. Unlike those others who contribute to this site, I never saw action during my 1968-'72 tour of duty in the U.S. Navy. The closest I ever came to being in harm's way was during ports of call in Turkey and other Middle-Eastern countries. Because of the prevailing anti-American sentiments in that part of the world at the time, we were ordered to travel about in groups of six or more when we went ashore. Our instructions were to "take whatever action necessary to protect ourselves and our shipmates" while off ship. Although we had to ignore profanities and had to dodge projectiles hurled at us a few times, there were no incidents. Today I came across an interesting obituary in our local newspaper. John Agnew - April 8, 2010 at the age of 88. 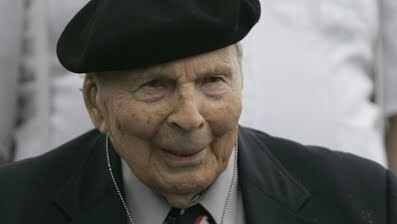 John 'Jack' Agnew, one of the original members of a U.S. Army unit that operated behind enemy lines in World War II and is often credited with having inspired the movie "The Dirty Dozen," has died at the age of 88. The Filthy Thirteen was the name given to a sub-unit of the regimental headquarters of the 506th Parachute Infantry Regiment, Division, of the United States Army, which fought in the European campaign in World War II. This unit was selected and trained to demolish enemy targets behind the lines. They were assigned to destroy a bridge over the Douve River during the Normandy Invasion of Europe in June 1944, a mission that cost the lives of most of these men. The group was airdropped for the mission by aircraft of the 440th Troop Carrier Group of the U.S. Army Air Force. 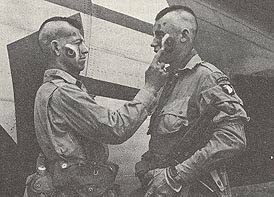 This unit was best known for the famous photo (above) which appeared in Stars and Stripes, showing two members wearing Indian-style mohawks and applying war paint to one another. The inspiration for this came from Jake McNiece, who was part Native-American. After a disciplinary incident while on leave, McNiece joined the "Pathfinders". These were paratroopers sent in ahead of the main force to guide them in. Expected casualties were 80-90%. The pathfinders were dropped into the encircled city of Bastogne at the height of the Battle of the Bulge. Their equipment enabled them to guide in subsequent airdrops of supplies crucial to the continued resistance of the trapped 101st Airborne Division. Many believe this unit was the inspiration for E.M. Nathanson's The Dirty Dozen a view supported by interviews with the daughter of a surviving member of the unit. Barbara Maloney, the daughter of John Agnew, a private in the Filthy Thirteen, told the American Valor Quarterly that her father felt that 30% of the movie's content was historically correct, including a scene where officers are captured during a training exercise. Unlike the Dirty Dozen, the Filthy Thirteen were not convicts; however, they were men prone to drinking and fighting and often spent time in the stockade. While there were similarities between the Filthy Thirteen and the Dirty Dozen, there were also many differences. The name "Filthy 13" referred to the fact that while training in England, they washed and shaved once a week and never cleaned their uniforms. R.I.P. John Agnew, a true American hero.